Car Information: Rose Beige Metallic Beige interior Two door hard top fastback body 390 Thunderbird V8 Automatic Transmission This car's home has been Southern California since new. We have owned it for about seven years and are the second owner's. The original owner lived in Redlands, CA where it was garaged most of its life. The body, chrome and interior are in very good original condition. The Sandi Beige paint appears to be the original paint and is a bit faded The dash, instrument panel, door panels, rear seat, carpets, headliner, and wire hub caps are original and like new. The front bucket seats, also original, though slightly worn, are in very good condition. All glass is excellent and in good working order. The tires have good tread, but need replacing because of their age. 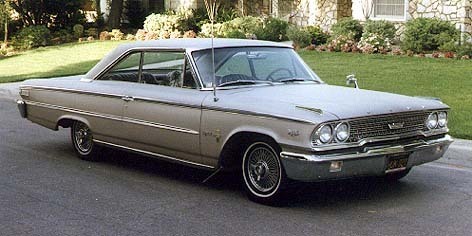 This Galaxie runs great and is a lot of fun to drive. My wife and I really love this car!